Boris came to the Medina Raptor Center in December 2007 from Mayfield Village as an adult of unknown age. She suffered a right wing fracture mid-shaft from unknown causes. Due to this injury, she has restricted ability to fly, being unable to gain any considerable height or sustain any flight. 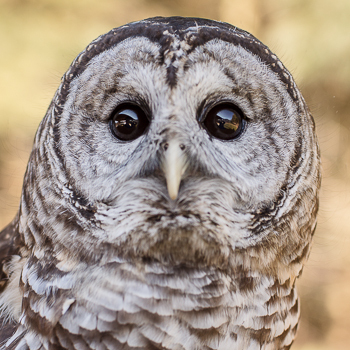 She currently shares her enclosure with Aurora, and serves as an educational ambassador for all Barred Owls. Head round with no ear tufts. Underparts whitish with dark streaks. Wings with dirty white barring. Ruff of feathers across upper breast barred. Small mammals, rabbits, birds, amphibians, reptiles, and invertebrates. Widespread resident east of Great Plains from southern Canada to the Gulf Coast and Florida. Also from southeastern Alaska southward to northern California and Idaho, and across central Canada. Disjunct populations in southern Mexico. Forested areas, from swamps and riparian areas to uplands. Wades in water to catch crayfish. Builds in cavities in deciduous trees or uses open nest made by hawk or crow. Also uses nest boxes. Increased greatly with historical deforestation of North America. No significant trend across North America, but some local increases and decreases. Resonant series of eight or nine hoots, “hoo-hoo-to-hoo, hoo-hoo-to-hoo-aw.” Also raucous jumble of cackles, hoots, caws, and gurgles.